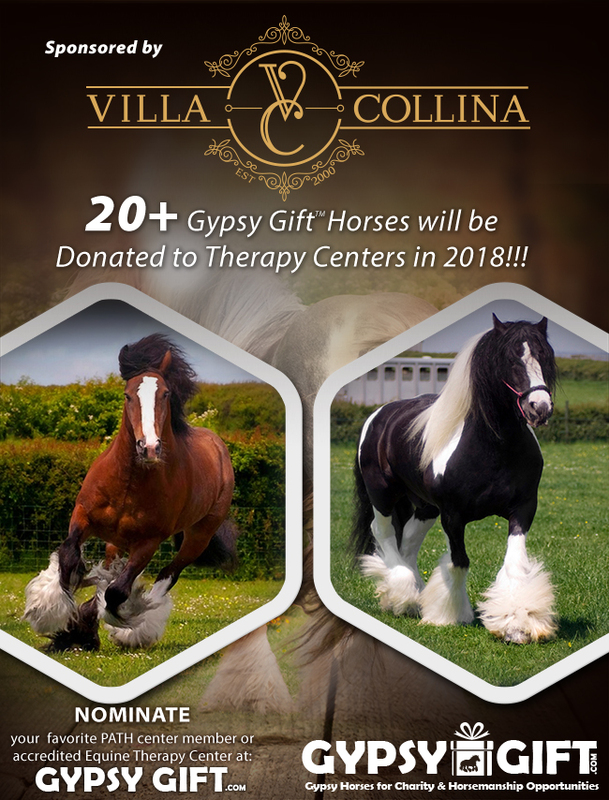 LexLin Gypsy Ranch is pleased to announce its fifth year of Gypsy Gift, where the largest Gypsy Vanner Ranch in the United States will donate 20-plus LexLin Gypsy Horses in 2018 to equine therapy centers across the U.S.
LexLin Gypsy Ranch is accepting nominations for PATH Premier Accredited EAAT Centers, member centers and other therapy programs now through 12 p.m. (noon) EST March 31st. Nominations can be submitted via the LexLin Gypsy Ranch website. “I am so excited that LexLin could continue Gypsy Gift for a fifth year. These therapy centers work so hard to make a difference in people’s lives. I am grateful LexLin Gypsy Ranch can be a small part of their mission,” LexLin President and CEO Dr. Eric W. Barton said. Daily voting (once every 24 hour period) will begin LexLin’s Facebook fan page at 12 p.m. (noon) EST on April 2, 2018, where fans can vote for their favorite nominated center to increase their odds of receiving a Gypsy Gift Horse. Daily voting will close at 12 p.m. (noon) EST on June 15, 2018. The top 20 nominated centers with the most fan “likes” on the LexLin Facebook page will be able to select their Gypsy Gift Horse in the order of most to least votes received with the center receiving the most votes making the first Gypsy Gift horse selection. The Villa Collina, a 40,250-square-foot waterfront mansion situated in Knoxville, TN., sponsors Gypsy Gift 2018 this year. The Villa Collina serves the community in diverse ways, including helping organizations like the Tennessee Veterans Business Association engage with their audiences and hosting fundraisers for charities. It is the largest home in Tennessee and the 87th largest home in the country. Since 2009, LexLin has matched 93 Gypsy Horses with Professional Association of Therapeutic Horsemanship International (PATH Intl.) accredited equine therapy centers coast to coast. In total, the donations are valued at over $1.2 million.